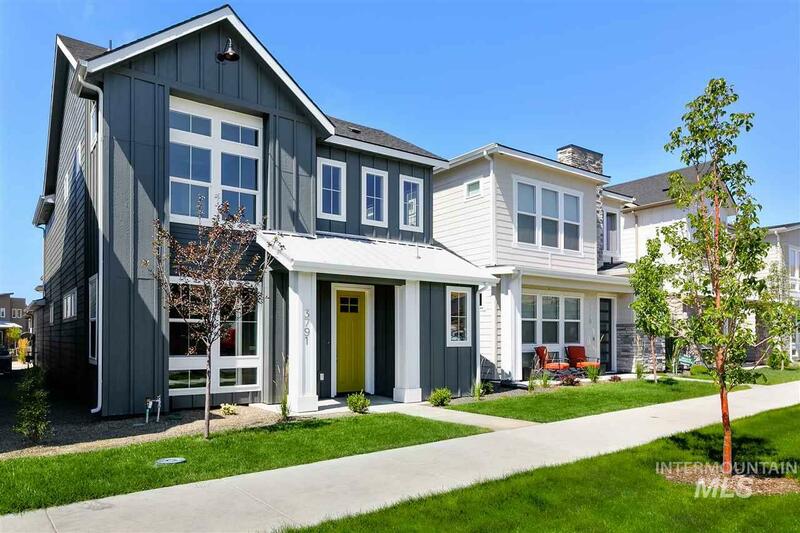 All Barber Junction at Harris homes currently listed for sale in Boise as of 04/21/2019 are shown below. You can change the search criteria at any time by pressing the 'Change Search' button below. "The Robie Fabulous location w/ front door facing onto common area. Enjoy the east morning sun from your private front courtyard. This master on the main plan features a spacious great room w/lots of natural light. You'll love the built-in entertainment bar, & private tech center w/ an abundance of natural light. Beautiful kitchen w/custom cabinets, quartz counters, industrial range looks out lg. picture windows onto generous size patio. Lg. built in mud bench w/ plenty of storage. Fantasti"
"The Hazel floorplan is 3 bed/2.5 bath with office, loft ,and balcony at 2309 SqFt. The front door is just steps from the Greenbelt! The main entry takes you to the open great room and kitchen with a gorgeous fireplace centerpiece. Features a hard to come by 3-car garage. The luxurious master suite provides an oasis of comfort. Relax with family and friends on the balcony overlooking the greenbelt. Rendering and photos similar. Some items subject to change. June 2019 completion"
"Move in ready. The Bannock is a 3 bedroom/2.5 bath, plus office, 2306 SqFt home. The main entry opens to the great room with a gorgeous fireplace centerpiece. The luxurious master suite provides a private oasis of comfort with a large walk-in closet, bathtub, and walk-in shower. The covered patio is a wonderful space for you to soak in the beautiful Idaho weather and gather friends and family. The front balcony overlooks the greenbelt, just steps out your front door! Photos similar." "Beautiful home steps away from the Boise Greenbelt! Right across from Barber Park and a short Greenbelt walk from Marianne Williams Park. Walk or bike to Lucky 13 Pizza and Lucky Peak Reservoir. Home features beautiful finishes throughout & the perfect floor plan. Spacious living area downstairs opens to beautiful kitchen & dining space perfect for entertaining. Upstairs features a sizable family room style loft which is a great area for the kids. Oversized master suite and master closet do not "
"The allure of The Wildflower floorplan will be clear the moment your eyes catch this charming 2,123 SqFt home. With the master on the main level this 3 bedroom, 2.5 bathroom home feels very spacious. Productivity will be a cinch with the included tech center, spacious enough for any project. Other features include a large kitchen island, gas range, and a large upstairs loft area. Mid June 2019 completion. Photos similar. Some items subject to change." "The allure of The Wildflower floorplan will be clear the moment your eyes catch this charming 2,123 SqFt home. With the master on the main level this 3 bedroom, 2.5 bathroom home feels very spacious. Productivity will be a cinch with the included tech center, spacious enough for any project. Other features include a large kitchen island, gas range, and a large upstairs loft area. Home is staged and move in ready. Photos similar. Some items subject to change."